Super Mario 64 - Beyond 120 Stars. Secrets and tricks in course 10 - Snowman's Land. Get both of the red coins on the freezing pond without using the shell! You should be able to get the one out in the open, without getting hurt at all (there's a secret to this part of the trick!). For the one in the center of the pond, you will have to die, but you should be able to get to the coin before you die (and before Bowser starts to laugh). Hint: Consider all of Mario's moves! Bigger Hint: Lookup BB here. In the freezing pond under the big bully there is a small iceberg. Can you stand on it? Jump from pillar to pillar in the mirror room (before entering Snowman's Land). It's best if you can make the jump and land on the other pillar standing up (but it is ok if you end up hanging on the edge of the other pillar). I've also been able to long jump off of one of the pillars! I don't think its possible to make it from the three near the Course 10 entrance to the two on the other side of the room, but you should be able to jump between any of the others. "Shell Shreddin' Up The Big Snowman"
I wish I could have said "Very very hard" as I have tried this AT LEAST 50 TIMES WITHOUT SUCCESS!!!!!!! 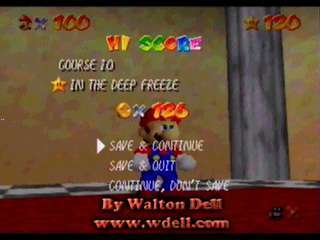 First, you've got to get the Koopa shell, figure out how to get over the "ice shooter", then jump to the higher ledge, jump then onto the narrow bridge (one end means you fall back to the beginning of the course, the other means you'll crash and fail the challenge). If you make it to the end, do a 90 degree turn quickly, then jump up to the higher area (the reason why you do that 90 degree turn is so that you avoid the tree, if you hang on to it, you lose the shell and the challenge). Yes, it is possible! In fact, I say it is "Easy/Medium". I made it past the penguin, and the snowman won't even try to blow you away as long as you are on the shell. First get 120 stars and see Yoshi. (You don't have to though.) Go up to the mirror room with the level "Snowman's Land" in it. Go up and press yourself against the mirror. Get the setting on close up Mario. Press <c or >c to get the view. Make sure Mario can still move. Move him in whatever direction of c button you pressed. Keep tapping that c button though! If you move slowly enough you should see through his head! Walk closer and you should see neither Mario or Lakitu. Walk even further [still tapping the c button] and Mario will walk through Lakitu. COOL! It's fairly easy but takes some practice. NOTE: You can do this with any other wall but it is really cool in the mirror or the invisible walls. And try this with cap Mario's for better effect! It is possible to shoot to the star on top of the tree. I have done it many times. You need to have good aim with the cannon. Once you practice for awhile it gets easy. Can you beat the the big bad guy without no punches...I can!! Go to the bully, and go to corner. Then, when the bully comes, jump, then hit Z (make sure your on the side that isn't by the ramp). Then he will fall and the star will appear. This is kind of hard because when you hit him he will not move far. Can you beat the big snow boss with one punch? I think people would think this is Very Hard, but I think it is Medium because I have done it several times. Go to the freezing pond, and try to get a red coin, get it and move Mario, who is screaming "Hahahahaha!" (because it's freezing), up to the bully and wipe him out by just getting frozen! If you touch the ice that the bully walks on [before wiping him out], you failed the trick. This is tricky. Sometimes if the snowman blows you, your hat might go into the "ice house." It is almost impossible to get it back because you will keep getting the star before the hat. To get it back [if you have saved the game], reset the game and go back into the level. A snowman will be wearing the hat. Collect the 8 red coins star in Snowman's land WITHOUT pressing the A button at all. My Reply: I think you mean no pressing A after you get the shell! Once you get the shell, it is very easy to get all the red coins without pressing A. How did you bust open the shell item box? How did you even get to the shell item box? I can think of a couple methods, but neither worked for me. Do the star: "Chill with the Big Bully". And when you start the level DO NOT press ANY BUTTONS. That means get the star without pressing any buttons whatsoever! So just get it using the control stick! Can you reach the shell using only the cannon? I have only done it twice, and my friends are still trying. Practice makes perfect! Let the snowman blow your hat away. Then go to the second tree on the left. Stand next to it. You'll be teleported to another tree. Get away from the tree and come back to the tree. You will be transported back. Go back to where the hat was blown. When you pick up the hat, there will be another hat under it. Keep picking the hats. Mario will be holding the hat in his hand. "King of the Snow Hill"
First, go to the tree closest to the stinging water. Point forward toward the snow hill. Jump, and if you are lucky, you will land on the snow hill. For the longest time I didn't know you could get coins from the snowmen!! Now, I have the right number of coins. Can you get the star on top of the snowman's head using the cannon? If you like the background music, you can download it from the music section of my web site.